This design is an old-fashioned image of children feeding birds, and even enjoying the company of a hungry squirrel. 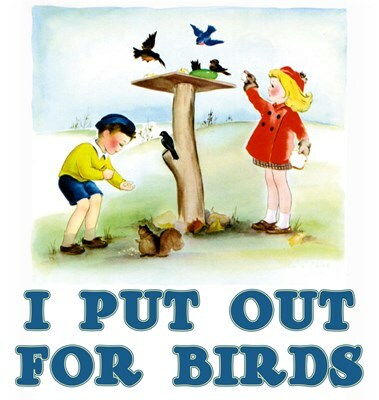 This birder and backyard bird lover humor has text "I Put Out For Birds." Great for anyone who's easy about feeding the birds. To order by phone, call toll-free at 1-877-809-1659 from Monday - Saturday 9:00am - 9:00pm EST. You'll need to note the Product Number 030-1319283460 to make your order.